Many organisations underestimate the challenges presented by a merger or demerger of companies or departments, often becoming so concerned with the financial and cultural implications, that they neglect the technological. 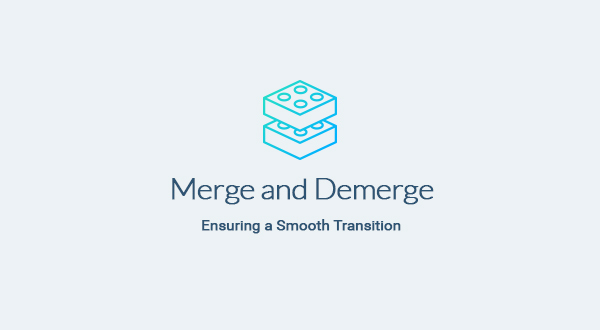 Merging or demerging will likely be the biggest undertaking your company will ever experience, presenting tests that can cripple your organisation if you’re not prepared. Studies show that two thirds of mergers fail to meet their objectives, beset by unforeseen issues from IT integration, source control, intellectual property, to training shortfalls – all occupying your management’s time to the point it becomes so thinly spread, you end up neglecting your core business. IT is overlooked during due diligence and at a strategic level, resulting in a failure to deliver the desired benefits and synergies. Achieving the simplification required for a successful merger or demerger can be complicated. Over time businesses create numerous procedures, manual steps, handoffs between teams, and so on, until processes are no longer harmonised and become deeply inefficient. Inefficient systems cost time and money. Exhaustive planning is your best friend. Key is to define the principles upfront that will allow you to operate harmoniously not just in the future but now. Identifying areas that overlap, planning for their smooth integration and unifying systems is vital. Keeping running costs low, not running two systems when you can run one, and the seamless integration of your technology stacks can help you seize an opportunity and start your new venture at full speed. Providing upfront analysis on how businesses overlap, while crafting a tailored set of procedures to make minimal changes. Implementing a set of independent programs to deliver your organisation’s requirements. Securely backing up data from your old or acquired system to a new system. Simplification can play a vital role for any organisation looking to streamline and enhance the efficiency of their core business. In a world of increasing competition and budgetary constraints it’s crucial your organisation operates efficiently. And your IT department has a key role to play in tackling this challenge head on. Simplification is an outcome-focussed process that involves reviewing the current state of your technology, identifying opportunities to trim waste and deliver greater efficiency and stability. Enterprise Blueprints creates tailored programs to analyse your workstreams and provide invaluable analysis for resolutions. Gone are the days when companies would bring in an expert to solve an individual issue. Today “system thinking” is a business essential – a holistic approach to fixing broken or inefficient processes. Systems have become so interconnected one issue can never be the sole focus of the problem solver. Instead it’s imperative to look end to end throughout the whole process, not just around the edges of individual faults. A clear understanding of your current processes and systems has to be your baseline. Which key areas you want to simplify? What processes are working for you and which aren’t? What does your landscape look like? What are your users saying? Enterprise Blueprints will analyse the data and lay the foundations for change. There is no magic bullet, but ticking off programs that may solve your problems and defining the solutions for the processes you want to fix, are the springboard for effective simplification. Enterprise Blueprints data-driven approach will provide the meticulous and measureable progress you need. Executing the programs we’ve helped you define, and implementing ongoing monitoring allows your organisation to see in simple terms the continuous improvements to your business. Enterprise Blueprints provides you with the tools to analyse and fix teething problems with monthly reviews. Identifying and tackling the hardest challenges two at a time, Enterprise Blueprints will finally ensure the new culture is successfully embedded. We value contribution, one of the ways that this is demonstrated is that we seek to understand first, before solving the problems. We know that we are a trusted specialist in IT Architecture, this reputation has built not just because we have demonstrated technical and domain expertise, it is because we have made the complex simple.